We’re getting on toward the end of the A-to-Z Challenge–only nine more letters to go–and I’ve done well with it. It’s April, and I’ve already gotten more traffic than I did during all of last year. I want to keep the habits I’ve started to build up here. I want to get to the end of the challenge, and keep going. So, now, I’m beginning to think about what happens after Z. I thought about blogging all the countries in the world, but considering how often I’ve gotten up and forced myself to make a last-minute post, that sounds like a lot of research. And probably a lot more diplomacy than I can muster, most days. Whenever I’ve done something repeatedly, I’ve gotten results. I may not have wound up at the Olympics, but I do wind up with something better than I had before. So, most of what I’ve done on the blog is from my novel. I’m revising as I go, so that’s a little slow going. I don’t think I could ever build up much of an audience from novel posts, although the people who like the novel really do seem to keep coming back for more. And I’ve done some short stories. My concern on short stories is whether posting them here is really the best way to go. Sometimes, when I’m writing for a blog hop, I get to a point where I’m looking at my story, and thinking “Hey, this is really good. What if I–” but I’ve already decided to use it for the blog. What I haven’t done–up until A-to-Z–is a Regular, Reliable schedule. Admittedly, there have been some times this month when I’ve felt like I’m chattering away at the Universe, but I have results to show for it. Good habits. A few new friends. So, what’s going to come after Z for you? Any plans? Suggestions? That is what I am working on myself on me. A Regular, Reliable Schedule. I have been going through Holly Lisle’s course How To Find Your Writing Discipline. It is only three days but has actually taken me five. Life stuff. Congratulations on doing so well on A to Z. I know you have because I have tried to visit you each day. It encourages me too. I have about 5 I have hit every day and then some here and there since I am not doing A to Z myself. I do not know how anyone visit all those blogs—the sheer number intimidates me which is why I did not do it. I am proud of you for doing it girl. You Go! Thank you so much for all of the encouragement! It means the world to me. The A-to-Z organizers only suggest visiting 5 blogs a day, so that makes it a lot easier than it looks at first glance. Of course, sometimes you have to visit a lot more than five to get five you can comment on. Some of them are not as active at the end of the challenge as at the beginning, and some are on topics where all you can say is “well-ll… I didn’t know that!” You should do it next year! i will think about it. I hope I will be in a better place mentally so will have more courage to try it. I did do NaNo, don’t know if will make my word count, but I am writing more. Have about 6000 words in so far shooting for 25000. I think writing to a regular schedule on a blog is always going to be tough. I’ve done it a lot in the past with different ideas but never managed to keep it going. I blog more sporadically these days but so long as I’m writing something I am quite content. Time to write has become so much harder this past year but I always strive to embrace a spare moment whenever it comes along. I’m hoping to keep it up, at least in part to keep my momentum off the challenge going. I’m not sure every day is going to work long-term, since it does seem to get in the way of some of the other things I need to work on. Thanks for stopping by. I can relate to this. If anything this blog challenge has pushed me to post regularly and that’s what I’ve been trying to do for over a year now. So this showed me that I’m capable even with all the other things I have going on in my life. Thanks for sharing. Might be the most encouraging thing I’ve heard all day. I can’t even remember the last time I had a good day at work. Yay for getting more traffic this year than last! I have too! Woot! 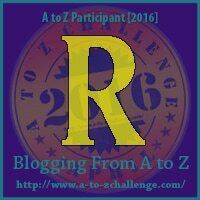 🙂 Keep up the A-Z posting goodness! Like you said, only 9 more days! 🙂 We’re almost there. Congratulations to you, too! Looks like this is paying off for a lot of us. This isn’t exactly a comment *on* this post but I’m enjoying what I read here!